On a morning that began under all-over baby blue skies, then turned leaden and drizzly during passenger emergency drill, ultimately concluding with spots of sunshine, the Eurodam departed the harbor at Copenhagen. A long line of 20 wind turbines, which, on a very windy day can produce up to 140 percent of Denmark’s electricity requirements, seemed to silently salute our departure by barely spinning. 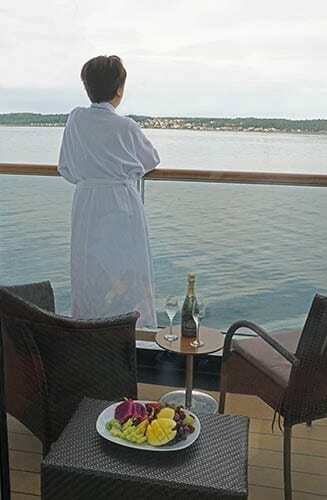 View from balcony of a Verandah Stateroom on msEurodam. As our voyage first commenced north, it was only a diversion that would soon loop south back toward Germany before leading to the east into the Baltic. At the thought of soon being in the “northern sea of raiders and traders,” I’m definitely feeling the resferberer. Being back on board the Eurodam is like catching up with an old friend. It mostly feels familiar, but I’m here to seek out if there any changes as well. 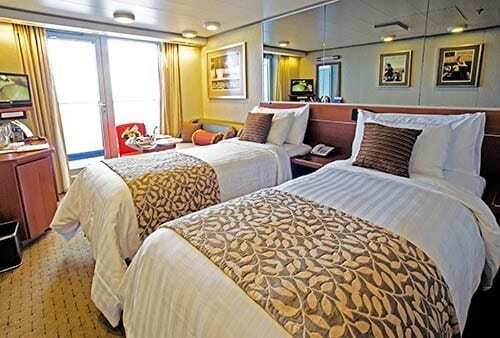 One aspect of cruising, with which my wife and I aren’t familiar, including on the Eurodam, is going upscale from our usual lower deck cabin to a reservation for this cruise in a deluxe verandah stateroom on the ship’s eighth level Navigation deck. Verandah stateroom’s bathroom on ms Eurodam with both shower and bath tub. There’s a time to be cheap (lowest possible price), a time to be frugal (best value for the money), and a time to enjoy a special perk. Spying the sliding glass door to a beckoning expanse of sea and sky, I immediately visualize the perk of luxuriating on our balcony during the coming days as worth it, by golly. After a brief stateroom inspection – the bathtub and large, extra-fluffy Egyptian cotton towels immediately caught my eye – there was also a surprise over by the balcony doorway. The spread of fresh fruit, appetizers, gourmet chocolates, fresh flowers, and bottle of French champagne proved a most pleasant welcome for my sweetie. We found it to be a nice touch on a HAL cruise for one of life’s special occasions, such as an anniversary or birthday. Following our gourmet stateroom lunch, and a few too many chocolates for desert, it was time for an afternoon of reconnoitering the ship’s eleven passenger decks. 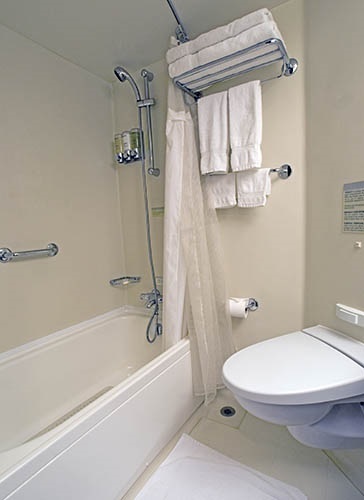 Billed as a “sophisticated mid-sized ship,” the Eurodam does not feel overwhelming. 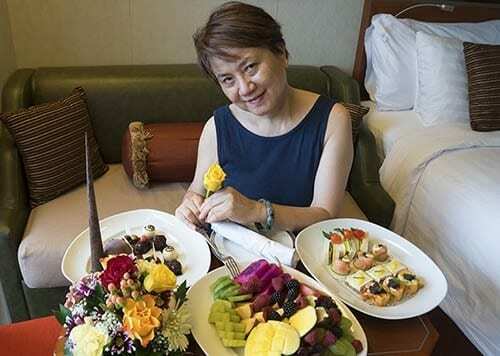 Not that it could be as intimate as a river cruise ship considering how many amenities are offered. Fully packed with 2,137 passengers and a crew of 900, that’s hardly surprising. Eurodam upper Rembrandt Dining Room. 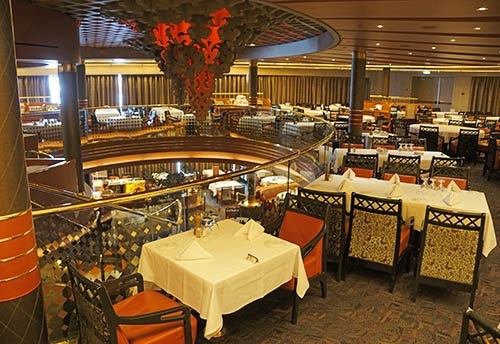 Seven distinct dining options are available aboard the Eurodam, all of which will require sampling in due course. Tonight we opt to take advantage of our open seating selection in the Rembrandt Dining Room available any time between 5:30 and 9:15 PM. Upon our arrival at 6:30 I ask if we could be seated at the table of a “fun group.” We are immediately seated with three Texans and four Australians, a sure recipe for an evening of fun-filled banter. 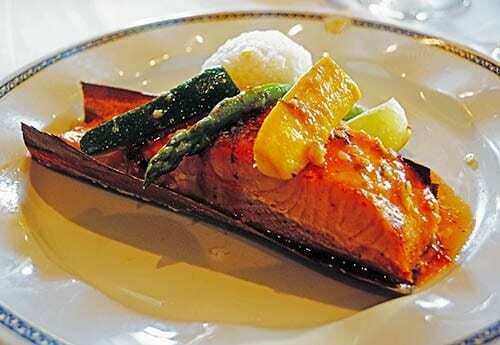 Cedar-baked red curry-coconut salmon is a Culinary Council member selection by Master Chef Rudi Sodamn on menu of the main Rembrandt Dining Room . The food in the Rembrandt is as beautifully presented as we remember it. What has changed a bit, according to the restaurant manager is that the portions have been downsized a bit in favor of increased flavor. While that may sound like a rationalization for scrimping on the servings, we’re soon satisfied that this is not the case. My starter of coconut-crusted scallops is designated as being a featured recipe of Culinary Council member Master Chef Rudi Sodamin, “the internationally respected food authority.” Jialin went for a culinary council selection as her main entrée, cedar-baked red curry-coconut salmon, which I admit, having helped her with half of a very generous piece, was about the most moist, flakey, and delicious salmon I have ever tasted. My vegetarian selection of baked-stuffed eggplant was quite nice as well. I can’t imagine our special meal, which we have reserved tomorrow evening in the Pinnacle Grill, can possibly be better.